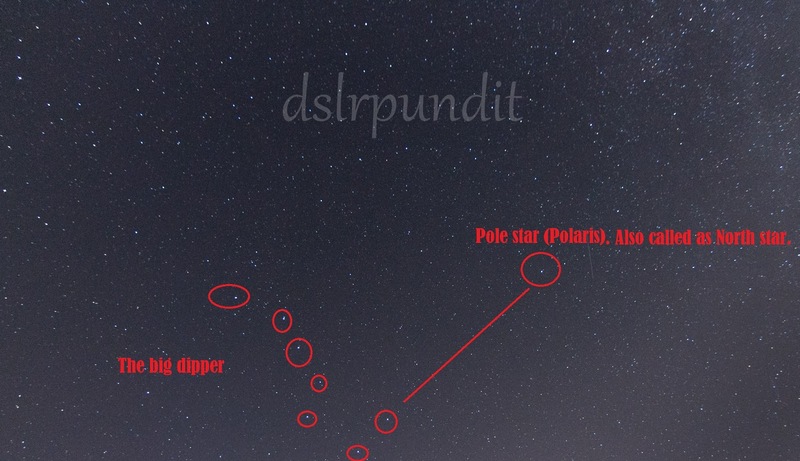 How to locate the Polaris for star trail DSLR photography? For the stargazers and DSLR photographers out there, Polaris (Polestar) is a really interesting astronomical body. Also known as polaris the north star, the attractive feature of this star is its fixed position in the sky. Okay, let's say it appears to be fixed as I do not want to start a technical discussion about astronomy here. While all the other stars appear to move in the sky due to earth's rotation, this star is a bit stubborn and never leaves. The hot topic for today is how to locate or find this star in a sky full of stars? The best and easiest way is to find the big dipper first which is also known by names such as a spoon, ladle, plough, etc. As a kid, I always used to call it a spoon. This seven-star asterism can easily be spotted on a clear night in a lesser light pollution area. It is a part of Ursa Major constellation. Once you know where the big dipper is, it will be easy to find polaris after that. The outer arms of this ladle or spoon point to the Polaris as shown in the image below. I took this image using my Tokina DSLR lens having 25 second exposure time, F2.8, ISO 800, auto white balance and a focal length of 11 mm. One other possible and easy way to locate the Polaris is to use a smartphone app. There are so many smartphone apps on the market available for free. To use these apps, just launch them and point your smartphone towards the sky. It will give you an approximate idea of where the pole star is located. The super cool thing about smartphone apps is they are free and user navigation is much better. One of my personal favourites would be Night Sky from iCandi apps. A couple of other good ones are Sky Safari and Star walk, both of them are paid though. Photos for star trail astrophotography can be taken on any clear sky night pointing the DSLR at any part of the sky. It can either be a single long duration shot or multiple photographs stacked using Star Stax. But why do we need Polaris for astrophotography? The simple answer would be to get more creative and unique images. Polaris (Pole Star or North Star) helps to form a circular spiral of star trails which tend to end at Pole Star. This gives a sense of depth to the image and is catchy to the eye. Other ways to capture creative star trails using your DSLR can be having a foreground like a tree, tower, house, etc. I will talk in depth about doing star trail photography using a DSLR in my next post. Interesting read about the difference. I don't own a nice camera but think that it is a good investment!